Ghanaian media has run agog with stories of Nigerian Pastor T.B. Joshua's purported conversations with Black Satellites coach Sellas Tetteh, during which he is said to have accurately predicted precise details regarding their final match against Brazil. The famed pastor of The Synagogue, Church Of All Nations in Lagos, known for his extensive charitable works and prophetic revelations, told Tetteh that the game would end goalless, penalties would determine the outcome, further saying Captain Dede Ayew should be the first player to take a penalty for victory to be ensured. Amidst doubts as to the legitimacy of such uncanny prophecy, Coach Tetteh confirmed he had been in contact with Pastor Joshua, the man also said to be the spiritual adviser of Ghanaian President John Atta Mills. “Before God and man I was in constant touch with Pastor Joshua – and all the predictions he made were realised,” said Tetteh on Ghanaian radio station Peace FM. “He told me we would win the trophy before the tournament and on the day of the game he again predicted it. To be honest with you and in the name of God, he even predicted the red card booking by the referee to our player (Daniel Addo) and subsequently warned us of the tough times that will befall in the hands of the Brazilians… At a point in time he even directed before the penalty shootout that the player in 10 jersey (Dede Ayew) should be elected to effect the first kick… "
The Black Satellites won the World Under-20 trophy last Friday, October 16 after a goalless game saw a tense and dramatic penalty shootout determine the winner. Dede Ayew taking the first spot kick for Ghana, the Satellites eventually won 4-3, sending Ghanaians and indeed Africans worldwide into wild celebrations. Since the revelation of Joshua's involvement came to public attention however, it has elicited a storm of debate as to the role of spirituality in sport, as well as the significance of the part Joshua played in the Satellites accomplishment. Adding to the furore is the fact that President Mills had publically testified to Joshua's prophetic gift days after his inauguration in January, saying that Joshua had accurately predicted specific details of his three-round election victory. In a similar occurrence, Nigerian Ambassador of Sports and Tourism, television personality and former soccer star, John Fashanu, has added credence to Tetteh's testimony by confirming T.B. Joshua also predicted the outcome of the Super Eagles qualifying encounter with Mozambique to him personally. “I called the man of God and said, “Man of God, what do you think?” He called back a few days later and told me, “Ambassador, Nigeria are going to win by one goal”. I was delighted. I went back and I told the players and the other special advisors,” he said, testifying to a packed auditorium at The Synagogue, Church Of All Nations on Sunday 18th October. 'Fash' further explained how Joshua even called him during the tense match which remained goalless until the 92nd minute when Obinna Nsofor headed home the winner for Nigeria. “5 minutes to the end of the game – and I'm sorry to say, I'd almost given up hope,” he confessed. “I thought, 'This is it. We're finished'. Number 1, we're out of the job. Number 2, we're out of the World Cup – and a World Cup in Africa without Nigeria is a disaster. 3 minutes to go and my phone rang. I picked up the phone and it was the unmistakeable number of the man of God. This was not the call I wanted to take because I thought he was going to say, 'Sorry Ambassador, I've made a mistake'. As I was on the phone, he was telling me, 'Goal!' 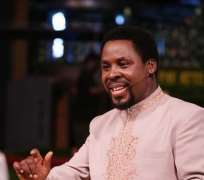 "
The Nigerian pastor is not new to controversy, but remains resolute in attributing the glory to God for such predictions. “There is no way I will come out and say who will win,” explained Joshua when asked about his conversations with Tetteh. “But what I can do, as a man of God, is to seek the mind of God concerning the situation and interpret the mind of God correctly without removing or adding anything. That is the work of prophets – to deliver God's message as you receive it,” he said, explaining that he is a mere mouthpiece and messenger of God, adding that he has done nothing to bring such prophecy to pass and thus boasting was uncalled for. “My advice to our sports teams, not only footballers, it to play the game as if everything depends on us and pray as if everything depends on God,” he said.